Meatless Mondays is a new weekly feature which will showcase some of my hits and probably misses with living a meatless life. Many of you know I stopped eating meat about a year ago for personal reasons. While, I haven’t had any desire to go back to eating meat, it has been a struggle to find healthy foods to eat. Will you join me on this journey by preparing one meatless dish every week? There is a movement called MeatlessMonday.com where you can learn more about this once a week challenge! Chop your apples and onions (optional). 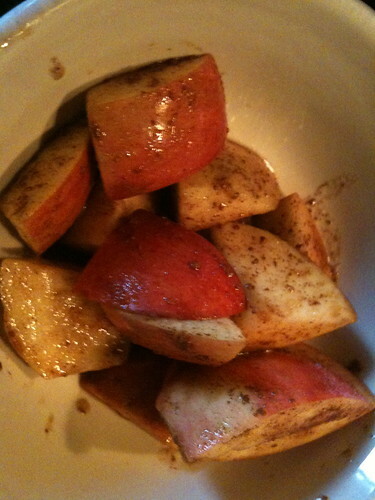 Add the lemon juice, brown sugar, and cinnamon. Place in microwave container with the rice ingredients (per box). Cook as directed. While this is cooking, prepare your side dishes. 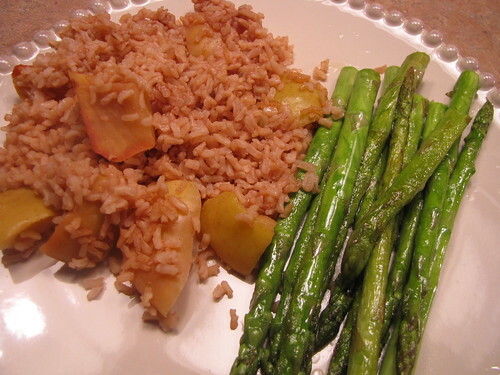 In the picture above, I trimmed the asparagus and simply sauteed with olive oil in a pan. For broccoli, I chop it and steam it. In our household, if it has onions, nobody else is going to touch it. So it is all me. 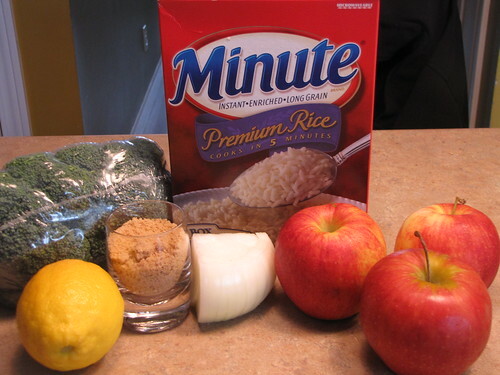 This is a tasty, quick meal, which can be made when apples on are on sale. It is a light dinner or lunch. You would think this would be super sweet dish but once cooked, it is the perfect mix of sweetness. I’m not sure. Readers, do you think this is freezer friendly? 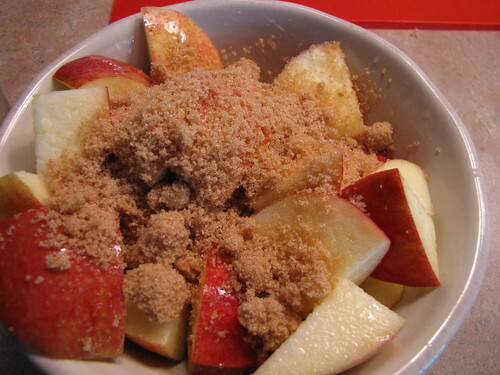 This same topping can also be used on pork tenderloins, pork chops, or chicken to meat it up! This should be vegan friendly. Yes, I’m sure you could freeze this, but the texture of the apples would probably change a bit (a little more watery and mushy). Or…if you intended to make and freeze it, undercook it slightly so that when you thaw and reheat it, it would cook up to a better consistency. I’m always looking for easy, filling lunches to take to work. 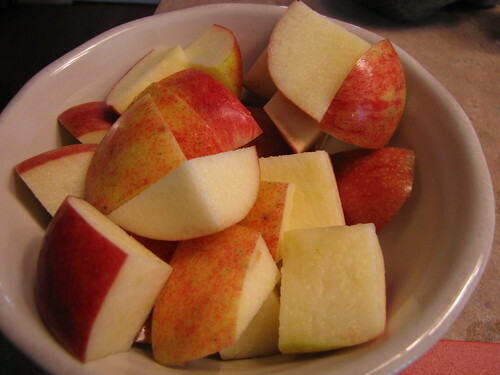 This looks like a good one that I will try this week…now that it’s November and wonderful apples are at all the local farm markets. Thanks so much for this! I’ve been a vegetarian since before I knew how to cook, and I always love creative recipes like this. This is something I’m sure my carnivore husband would love. For the record, if someone claims to be a vegetarian but then they say they eat fish, then they are not a vegetarian (vegetarians are lacto, ovo-lacto, and vegan, but no veg would ever eat fish). Contrary to the directions, I recommend cooking the noodles last as my noodles stuck together while waiting for the sauce to heat. Otherwise, a very tasty meal. .-= Danielle @ Sacramento Green Deals´s last blog ..Best Rite Aid Green Deals 4/4 to 4/10 =-. This looks yummy! I am not a vegetarian but I do not eat red meat at all and I am very picky about what cuts of pork I eat. I wanted to try the lasagna from last week but after reading your family’s reaction, I cooked it with noodles and spinach, but no Polenta. Do you have any other recipes with Polenta in it that you have liked? I think I could be vegetarian without a lot of discipline needed with very few eceptions, but I have a question about your particular lifestyle…well, 2. First, do you eat seafood at all, because I know some vegetarians that won’t eat land animals but consider seafood a part of their diet. I don’t think I could give up seafood…shrimp could be their own food group as far as I’m concerned. How do your kids react to the lifestyle? Have they expressed interest in joining you? I’ve thought so many times about trying to become vegetarian, but I am a picky eater so I can easily see my health going even farther down the drain than it already is if I didn’t get my protein from chicken. But not being able to afford the “organic” or cage-free meat choices, and the higher priced options of food where the animals are treated with a modicum of dignity and decency, I have a problem with eating meat where I am afraid the animals are treated with cruelty. Still, I haven’t had the guts to change but that’s a story for my own blog I guess lol. Sorry to get that started. Was it hard to get used to it? .-= Kristin´s last blog ..Gift Idea for Dad: Official World Series Film Collection =-. Kristin, I know the questions weren’t addressed to me ;) But thought I would throw out some ideas! If you want to switch, go with what works for you! Yes, there are labels out there and definitions, but there is no reason you would have to stick with any one. My sister, for example, only eat poultry and fish, no seafood or red meats (or pork, is that read meat!?) and that works for her. We both switched our diet at the same time, I first dropped red meats and continued to eat poultry for awhile, then dropped that too, she stuck with the poultry. When I started out, I ate a little fish and shrimp. It got to the point where I couldn’t stomach eating either. I also want eat eggs plain but I will eat eggs if it is cooked in something and I can’t taste it. I think you have to do what you feel comfortable with and I personally think it is great that anyone would want to try to reduce their meat intake! As for affording organic or cage free meat….we buy a local cow and a local hog and store it in our freezer. We know where it came from…the cow grows up about a mile from our house. Actually, if you can split one with friends it is actually cheaper than other options! For me, once I made the choice it was easy. I haven’t missed meat one bit. However, I was at the point where I was completely grossed out by meat! Hope that helps!